The analysis of active filters requires.complex mathematical methods that are beyond scope of this book. We will therefore concentrate on practical design methods that will allow us to construct Butterworth and Chebyshev filters of various types and orders. The discussion that follows is based on design procedures using tables that can be found in Rapid l’ractical Designs of Active Filters, by Johnson and Hilburn (Wiley, 1975). Space limitations prevent us from listing all the tables that arc available in that reference, so we will simply illustrate how a few of them arc used in filler dcsign. Readers wishing a more comprehensive treatment should consult the reference. capacitance, depending on whether a high-pass or low-pass filter is desired. Table 14-1 shows the impedance type required Ior each design. We see, for example. that Z” is a resistor, designated Rio for a low-pass IiIter and is a capacitor, designated C, for a high-pass filter. 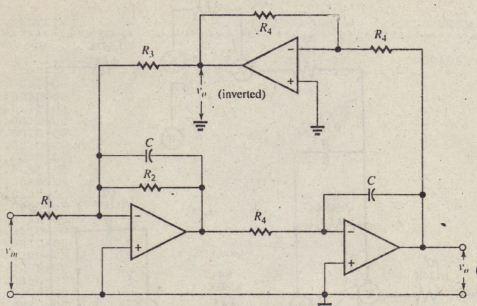 The VCVS’ design can also be constructed as a bandpass filter using another component arrangement (not shown). Where is the desired cutoff frequency in Hz .and C is the value of capacitance selected, in farads. We then consult an appropriate table to obtain factors by which K is multiplied to give each resistor value. Tables 14-2 through 14-4 are three such tables. These can be used to design a low-pass Butterworth. 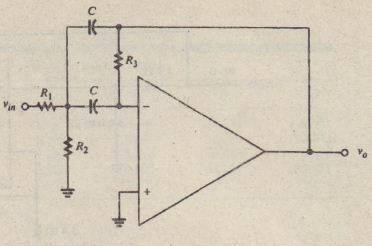 a low-pass Chcbyshev with 2-00 ripple width. or a high-pass Chebyshcv with 2- width. The next example illustrates how they arc used. With reference to we construct the required filter as shown in Figure 14-54. Note that precision, nonstandard component values’ are required if we demand exact conformity to the original design specifications. Generally speaking, satisfactory performance can be obtained (in low-order filters) by using the closest 5% standard values. 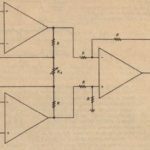 Another popular active filter is the biquad design, which can be constructed in low-pass, high-pass, or bandpass configurations. 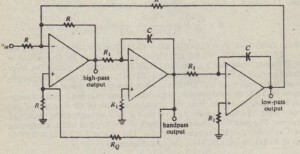 Figure 14-56 shows the low-pass version. 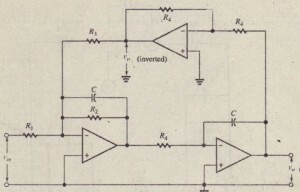 Although this design requires three amplifiers and a greater number of passive components than the YCYS or IGMF filters, it has the advantage that its gain and cutoff frequency are easily adjusted .. Also, both an inverted and a noninverted output are available, as shown in Figure 14-56. The gain of this filter is the gain is varied by adjusting RJ, while changing R.I varies both the gain and the cutoff frequency. A value of gain G is also chosen. The factors that multiply K to determine the other component values are then taken from a table. Table 14-6 shows themultiplying ‘factors for second-order Butterworth responses and Chebyshev responses having several different ripple widths. Notice that the multiplying factor for RI is divided by the user-selected value of gain. Higher-order filters can be designed by cascading stages and using appropriate sets of tables available in the previously cited reference. Then, from Table 14-6, RI = (2.2481G) kil = (2.248/2) kH = 1.124 kil, R ~ 2.468 kf], R3 = 2.248 and R4 = 1.592 kH. 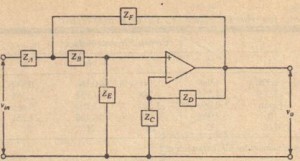 Figure 14-57(a) shows the filter circuit in its SPICE format. Note that a subcircuit (SUBCKT) is used to specify the three operational amplifiers. 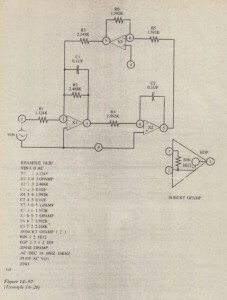 The subcircuit, named OPAMP, models a nearly ideal amplifier having input resistance 1 X’ 1012 and open-loop voltage gain 1 X 109 the results of an .AC analysis over the frequency range from 10 Hz through 10 kHz. 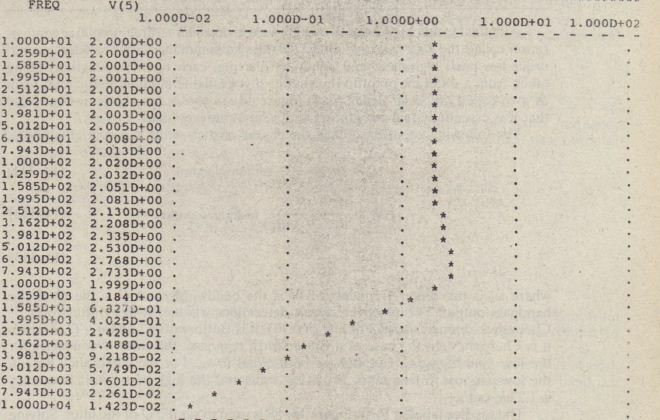 Note the characteristic rise in the response of the Chebyshev filter. The low-frequency gain is seen to be 2, as required by the design specifications. 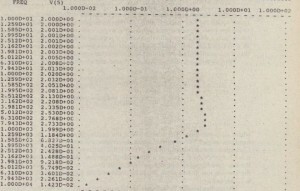 The gain then rises and falls back to 1.999 ::::2:: at 1 kHz, confirming that the Chebyshev cutoff frequency is 1 kHz. The gain at 5.012 kHz is 0.0574.1] and that at 10 kHz is 0.01423. Thus, the gain changes. 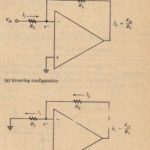 As a final example of an active filter, we will consider a three-amplifier configuration called the state-variable filter. This design simultaneously provides secondorder low-pass, high-pass, and bandpass filtering, each of Ihl:SC functions being . taken from a different point in the circuit. It is available in integrated-circuit form as a so-called universal active filler. Figure 14-58 shows the configuration. Note that it is essentially two integrators and a summing amplifier. where w” is the center frequency, BW is the bandwidth, and Q is the Q of the bandpass output. The Q of the circuit determines whether it has Butterworth or Chebyshcv characteristics. For a Q of 0.707, it is Butterworth. and for a Q ofO.X85, it is Chebyshcv. In the case of a Butterworth response, the cutoff frequencies for . 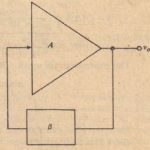 the low- and high-pass outputs arc both equal to WO’ For the Chebyshev design, the low-pass cutoff frequency is O.812wo rad/s and the high-pass cutof.f frequency is 1.23w” rad/s. 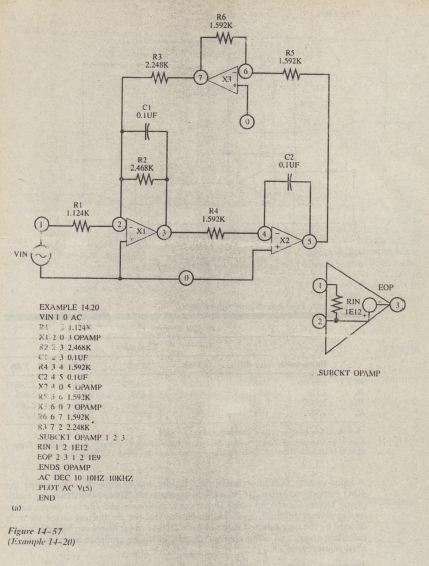 Design a state-variable filter with Butterworth characteristics and center frequency 1.59 kHz. 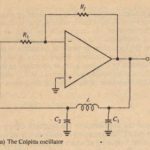 What are the cutoff frequencies of the low-pa s and high-pas outputs? 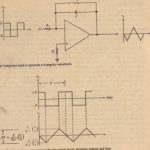 What is the bandwidth of the bandpass output? 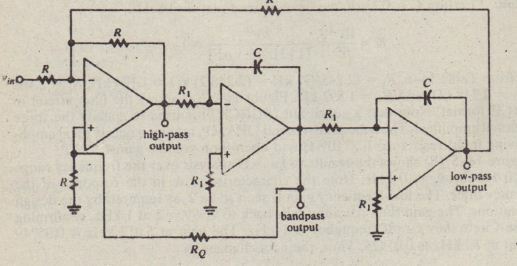 Note that the “center” frequency in this low-Q filter is not midway between the cutoff frequencies of the bandpass.